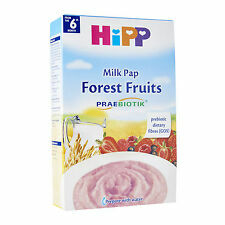 HIPP Organic Milk Pap with Forest Fruits. Great source of minerals like calcium and iron, digestive fibers. 250g 8.8oz. Food & beverages. from 6 Months. Normally it takes approx. We're here to help and solve any issues. #1 Rated HiPP Organic Distributor - Choose your Flavor! #1 Top Rated HiPP Organic Distributor in the USA! HIPP FRUIT & CEREALS APPLE AND BANANA. More HiPP will be listed in due course. 1 JAR 190g FROM 6 MONTHS ,FRESH. EXPIRY DATE 31 JULY 2018. WEIGHT : 307.00 GRS. HEIGHT : 9.00 CM. NO ADDED SUGARS. ORGANIC COMBIOTIK - 2. MILK POWDER 600 Gram. ORIGINAL GERMAN PRODUCT. DIRECT FROM GERMANY TO YOU. FROM THE 6. HIPP FINE FRUITS ORGANIC MILK PAP. More HiPP will be listed in due course. Buy all 9 mugs in our collection! -NEW RECIPE /PREPARE WITH WATER. HEIGHT : 4.5 CM. WIDTH : 13 CM. LENGTH : 20 CM. ON SALE IS. HiPP organic milk porridge Good night "semolina banana" As a basis for organic milk puddings, baby-friendly follow-on milk is used, which is suitable as an ingredient in porridge after the 4th to 6th month. (Note in the preparation of infant formulas instructions very carefully. Do not heat food in the microwave (risk of scalding). Preparation 1) Boil fresh water and allow to cool to about 40 ° -50 ° C .
(Eat a balanced diet and healthy lifestyle of your baby. Organic Milk Porridge Good Night Kid Biscuit From 6 Months, 2x 0.5 kg. boil 1) of water for every Breimahlzeit fresh. Allow to cool to about 50 ° C. give 2) Powder amount (acc. (Preparation 1) Boil fresh water and allow to cool to about 40 ° -50 ° C . Check temperature. Productfeatures :Bio. Organic follow-on milk. Incorrect preparation or storage of the prepared bottle for a longer period can cause health problems such.lead by example the growth of unwanted germs.Do not use food leftovers.clean bottle, teat and ring thoroughly. Hipp 6 Month Organic Penne with Tomato & Courgette is a delicious and nutritious baby food that's suitable for little ones aged 6 months . Made with the finest organic ingredients picked at the peak of ripeness, this baby food is bursting with goodness and flavour. Hipp Organic Baby Food Combiotic Follow On Milk From 6 Months 800G (4 Pack). Hipp Creamy Porridge (6 ) - Dried [160g x 4]. Hipp Organic Good Night Milk from 6 Months Onwards 350g (10 Pack). Hipp Penne Tomato & Courgette (6 ) [125g x 6] (4 Pack). Hipp Creamed Porridge Breakfast (6 ) [125g x 6] (6 Pack). Month Bio Wheat Nibble Tender Pink. to nibble with the first teeth. Marke HiPP. Wheat flour, sugar, yeast, butter, vegetable oil, malt extract, milk powder, lecithin, salt, vitamin B1. delicate and digestible. 600 g original HIPP organic Combiotik initial milk 1. Therefore, it is suitable from birth as a complete food and is good filling. Marke HiPP. Ingredients from organic production. Maßeinheit kg. as breast milk contains only milk sugar (lactose). 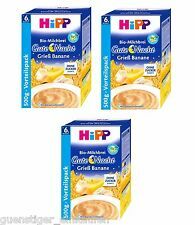 Hipp Organic porridge Goodnight Semolina banana. the HiPP Good Night Porridge Semolina banana with whole grain flakes. The HiPP Good Night Porridge with full cereals. Therefore, for the full value of cereals used by HiPP. 6 x 350 g Hipp organic 5 grain porridge with whole wheat no sugar added. HiPP organic porridge 5-grain, for the secure and balanced nutrition of your baby. Marke HiPP. no sugar added: ingredients contain natural sugar. 3 x 250 g Hipp organic porridge good morning! Bircher muesli without added sugar. HiPP Organic porridge Good morning! Bircher muesli is tailored to this need. Therefore HiPP is Good morning! with delicate cereal flakes an ideal and easily digestible breakfast for her baby. Hipp Penne Tomato & Courgette (6 ) [125g x 6] (5 Pack). Hipp Creamed Porridge Breakfast (6 ) [125g x 6] (5 Pack). 3 x 350 g Hipp organic 5 grain porridge with whole wheat no sugar added. HiPP organic porridge 5-grain, for the secure and balanced nutrition of your baby. Marke HiPP. no sugar added: ingredients contain natural sugar.